It’s a fabulous word. It’s a word that we LOVE in our vocabulary. We love it because it gives us the right to do anything and everything that we want. I’m not cheating on my diet, I’m just indulging myself. And that is not always a bad thing. Especially this week. July 4th. Most people are off work and we will be barbequeing all week. I say go. Do it. 99% of us are not elite athletes. We take care of ourselves, but if you are taking such good care of yourself that you can’t have any fun or ANY indulgences….ever….that is not enjoyable. Ask athletes. Ask them what they sacrifice to be where they are. It’s really tough, and for most of us, it is neither realistic, nor worth it. So enjoy yourself, and don’t feel guilty about what you eat, drink or do over the week. Now, that is not the so-called “Golden Ticket”. Try to do something over the week. Take a run or hit the gym or something. Keep it in moderation, but don’t deprive yourself of enjoying life. That makes life no fun. No, really! I promise it’s not boring! Well, not to me anyway. So I was doing some research yesterday. 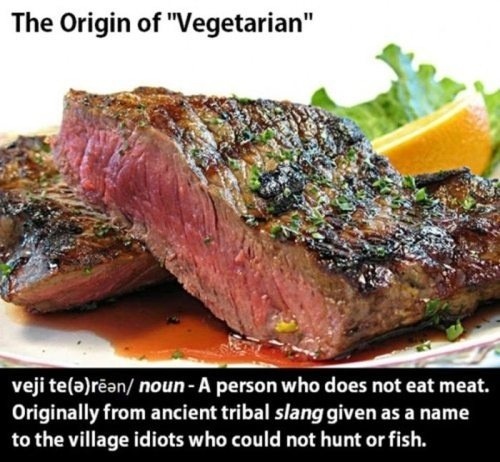 Researching vegetarianism and it’s roots. What I was looking for was where the genesis of the thought that eating no meat and/or animal products is a healthier way of life. So what I found is that vegetarianism dates back to BC times (various points, depending on what time lines/religions you follow). And that it’s popularity has come and gone in waves over the centuries and millenia. What I did NOT find, however, was hard proof that it’s a healthier better lifestyle. the popularity and premise of vegetarianism has, in truth, always been based on moral, ethical and religious belief, not scientific study. It started with Hindus who practice nonviolence to animals (“ahinsa“). By belief, not health. Through Buddhism, certain sects of Christianity and modern times, it’s all the same. Not proof, belief. And even today, for all the studies that say that vegetarianism is a healthier way to a longer life, I could find just as much scientific study that says it isn’t. Meat, in fact, is good for you. There is a reason that man evolved as hunters first, and gatherers second. Hunting is instinct and farming is learned. Meat is not inherently bad for you, as some would have you believe. It has vital nutrients, vitamins and minerals that you really don’t get much of anywhere else. Personally, I am a carnivore. I am not against vegetarians or vegetarianism. But to those who spout “proof” that it is better for you and that meat is the root of all health problems, I say prove it. Definitively and beyond a reasonable doubt. That’s a harder path to go. Now, this will probably offend some people, and I”m OK with that. It’s not the true origin of the word, but it was just way too funny to pass up. Enjoy. So, I’m, sorry that this is late. And props to Health Coach Penny for the graphic. There IS a better way. Look at the timeline, and tell me where everything health-wise went to hell in a handbasket! Some things are just way, way, WAY too easy. This is one. Pretty self-explanatory. Do they really not scout out better locations for this stuff? 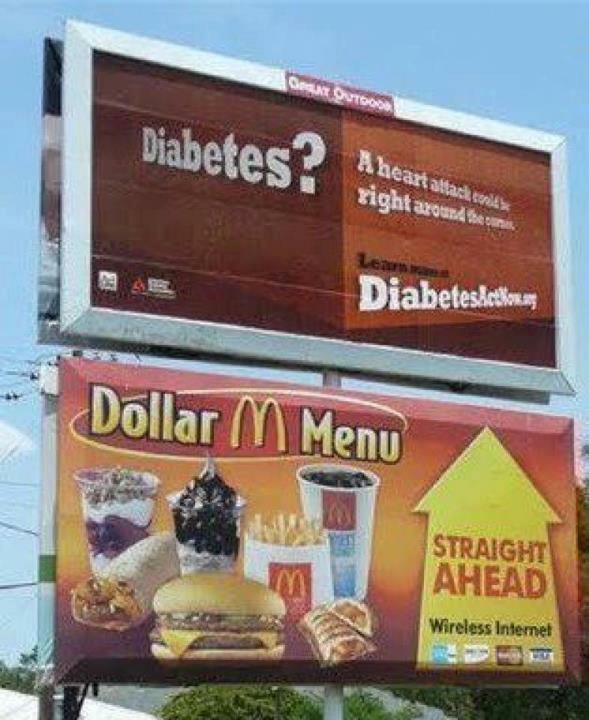 Or maybe just really good planning by the Diabetes Association. Bravo, I say! “It is historical continuity that maintains most assumption, not repeated assessment of their validity.” – Edward de Bono. So right with so many different things, including exercise. Ask yourself “Why do I do it?”? Because of some scientifically validated principle, or because so-and-so told me to. Whether so-and-so be a friend, team mate, video or trainer. We do SO MUCH just because we are told to. Accepted truth. Lemmings are a fantastic example of this group mentality. They commit mass suicide by running off cliffs. Not because it is biologically necessary, but because the one next to them is. Crazy. For centuries, it was accepted truth that the Earth was flat. Not by science, but by blind faith. Silly. I hereby challenge you. I challenge you to challenge the “truth”. Question it. Explore it. Re-think it. Why is this the way? Could there be a better way? Look at your exercise program and ask yourself why you are doing it. You might be surprised and appalled at the answer, because it’s just because it’s what you’ve always done. You don’t know why it’s good (or IF it’s good, for that matter). But you do it. I tell my classes all the time here. Just because it’s accepted, doesn’t mean that it’s right. Use your ability to reason, and don’t accept things on blind faith. Analyze it, question it, RE-THINK it! 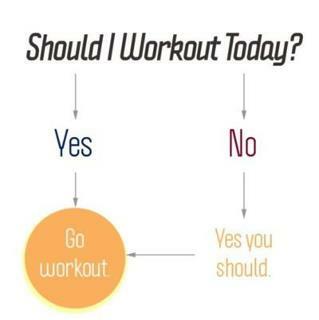 NOW, go exercise. If some is good, then more is better. It’s the American way, right? A society of excess. From money (“The root of all evil.”), to possessions (“You can’t take it with you.”), to food (3rd highest obesity rate in the world). Well, apparently the same is true of exercise. I preach to my clients all the time about excess in the negative. Encouraging down time and the fact that sometimes less is more. A new study by Dr. James O’Keefe at St. Luke’s Hospital in Kansas City, and confirmed by review at the Mayo clinic does, in fact, say that too much is too much. Specifically targeted at chronic aerobic training and the phenomenon of “Ultra” sports. I have written before about the oxidative damage that these things can cause and the links to premature aging, and hypothetical (however, unproven) possibilities of the cancers and early heart problems. Well, this seems to confirm it. The condition, as currently named, is called Phidippides Cardiomyopathy. It’s named after the Greek soldier who ran the first 26.2 miles to deliver information about the battle of Marathon. He died. Well, it appears that extreme endurance training (over 60 minutes) creates significant structural and biochemical alterations in the cardiac muscle of the heart. These markers return to normal fairly quickly when you stop exercising, but over the course of time are showing to leave areas of patchy scarring on the heart tissue and, in some cases, abnormal heart rhythms. Extreme runners have shown better than 1/10 to have evidence of this scarring and a 5-fold increase in risk of cardiovascular disease than runners of non-extreme status. 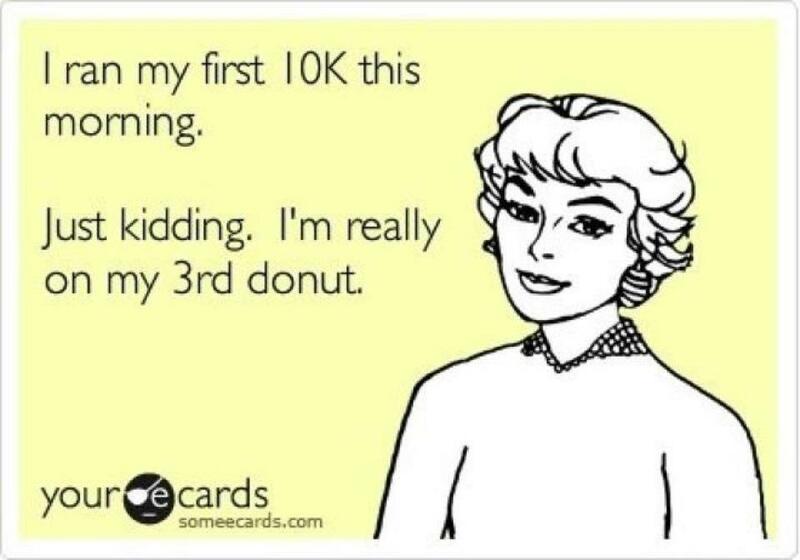 There also seems to be a law of diminishing returns with exercise. That after about an hour, you get less out of it than you put in. So, really, you are working backwards. So just like with anything, moderation is the key. Yes, exercise is good. But even a good thing in excessive quantities can be turned into a bad thing. Be smart. Why do people hate exercise? Because of bias and experience. Ask yourself how you perceive exercise…..joy, or chore? To most, it’s a chore. Something that we do because we HAVE to, not because we WANT to. You have to find some part of it that you LOVE. Something in exercise that makes you say…”I want to feel THAT every day.” Then, you’ll do it. Forever. Regardless of time or cost. If you consider exercise a chore, you will never, ever, EVER be successful at it. Mainly because you will give up on it. All exercise has SOME benefit to it (even yoga…haha). No exercise is the PERFECT exercise. A very wise trainer once told me that the best form of exercise that a person CAN do is the form of exercise that they WILL do. It’s very simply, really. If you like it, you’ll do it. If you do it, you will derive benefit. If you hate it, you won’t do it. If you don’t do it, you will not derive benefit. So find what you like. What you enjoy. Then do it. So, as a person and exerciser, you have three main concerns: Figuring out WHAT do do, Figuring out HOW to do it, and then doing it RIGHT. Because you also have to remember that even the best exercise, when done improperly can be harmful and detrimental. So make every session count. Make every REP count. Find what you LOVE about exercise. Inside, outside, bike, weights, pool….the list goes on for days. Make it work for you.